I'm not sure what exactly. But if you think you know leave me a caption. After Robin Hood, there was Robin FROM The Hood. Thirtysome years later, The Jacksons are No. 1 with a bullet again. Post Apocalyptic group, Earth, Wind, and Gunfire hits number one song: We Are The World! Why we fight... So they don't have to. 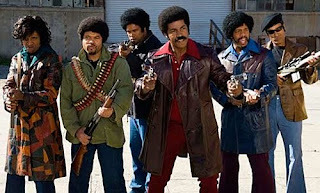 Directing under the name Issaac Washington (his iconic bartender character in "The Love Boat"), Ted Lange has just released his cinematic reboot of "The Mod Squad." Gladys Knight and the Pimps. Ladies and Gentlemen, YOUR BOSTON CELTICS! Yo yo yo! Which way to Michael Vick's house, cuz? I'm sorry. What is this post about? I've been trying to remove the first picture for a couple of minutes now. Seems it's interfering with the remaining post. Don: Ha, ha, you're so transfixed by that pic you've commented on the wrong post! Durrell Johnson sings "Shaniqua,I just met a girl named, Shaniqua!" during a pivotal moment in the new off Broadway production of "East Compton Story"